An Open Letter To Primary Care Physicians | Replace the RUC! In its present form, the Resource-Based Relative Value Scale (RBRVS) financially undervalues the challenges associated with primary care management of complicated patients, but favors complex procedures. It is fair to suggest that a significant percentage of the US’ rapid health care premium cost growth – 4 times as fast as general inflation over the past decade – is directly attributable to the RUC’s distortion of this system. Many health care economists now believe that half or more of all American health care expenditures are inappropriate and provide no value. This translates to nearly $1.5 trillion annually, a sum nearly equal to this year’s national debt, twice what we’ll spend on the military this year, or two-thirds again what we’ll spend over the next decade on the economic stimulus package. The health care cost drivers, as they’ve been constituted through RBRVS and the RUC, are the difference between America’s economic prosperity and decline. We have undertaken a four-pronged effort aimed at replacing the RUC and RBRVS. Make the public aware of the RUC’s role and urge the primary care societies to stop “enabling” the RUC through their participation.While one of the main goals of RBRVS was to rectify the payment gap between primary care physicians and specialists, the RUC has intensified it. 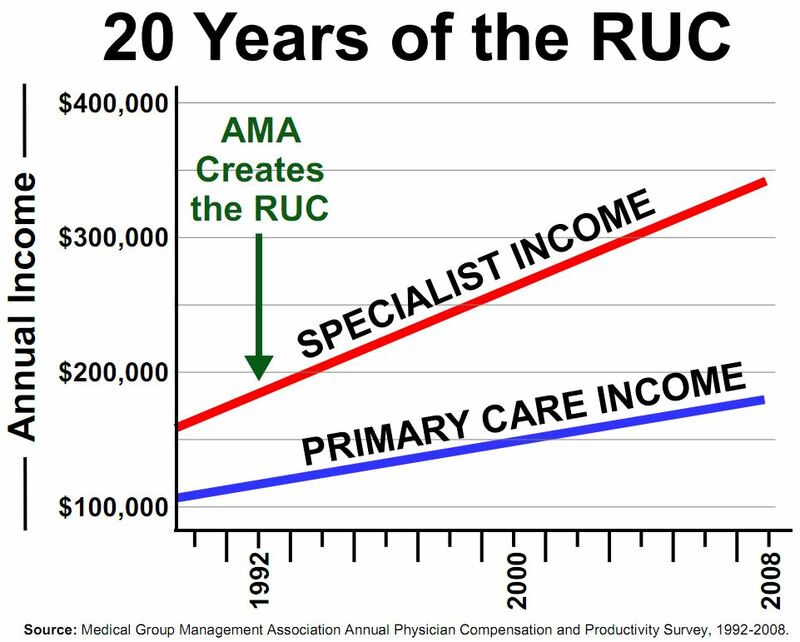 After 20 years of minority participation on the RUC, the average primary care physician can expect to make $3.5 million less over a career than his/her specialist colleagues. Worse, though, is that often unnecessary but expensive procedures dramatically drive up cost while diminishing quality. If the societies loudly and visibly walked away from the RUC, with clear, at-the-ready explanations of why payment parity is critical to the future of primary care and how the lack of it has negatively impacted American health care and the nation’s economy, it would bring the issue to the fore and set the stage for the RUC’s and RBRVS’ replacement by better approaches that appreciate all kinds of complexity and measurable value. Health care funds are and should be limited. In an market that empowers primary care, fewer unnecessary services may translate to lower compensation for specialists. Recruit experts who can credibly calculate the economic impacts of the RUC’s actions, and who can devise alternative payment methodologies. We believe it will be critically important to not simply demand an end to the current system, but to offer sensible alternatives. Demonstrate the unlawfulness of CMS’ (and HCFA’s) two-decades long reliance on the RUC. We are exploring a lawsuit that would challenge CMS’ longstanding abrogation of its due-diligence process by outsourcing medical procedure valuation to the RUC, an informal, private, financially-conflicted group employing a highly questionable evaluation methodology. Even so, CMS has accepted 94% of the RUC’s recommendations, which most often increase cost. Develop a collaboration between primary care and non-health care business. Most of the health care industry benefits handsomely from the excess associated with the current payment system. If it is threatened, they are likely focus considerable resources on blocking change. (The health care industry contributed $1.2 billion to Congress in 2009 to influence the health care bill.) Non-health care business is primary care’s best ally. They understand primary care’s value, are large enough, have the resources and the motivation to counterbalance the health industry’s influence. We hope you’ll support this effort in several ways. Contact your primary care society to demand that they withdraw from the RUC. Broaden awareness of what we’re doing and why by rebroadcasting to your primary care colleagues. Get in touch to help us with resources, relationships or approaches that can strengthen this project. Thanks much for your time and consideration. Paul M. Fischer, MD is a family physician at The Center for Primary Care in Augusta, GA.
Efforts to clarify and improve the methodology used for determining physician reimbursement are overdue. 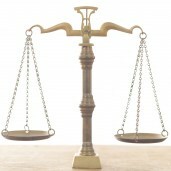 Accuracy in presentation of information is needed to have an educated discussion. As such I would recommend immediate and significant updates to your website replacetheruc.com. However, let’s assume that all aspects of healthcare spending need to be evaluated and physician compensation, while not the biggest issue, is an issue. The primary premise of the question that you raise relates to the hourly rate for physician compensation. Is one physician’s knowledge or skill more financially valuable than another? Is there a scalable rate adjustment that could be applied to years of training or complexity of care provided? Is there a value to technical skill? Can technical skills be evaluated by a metric? Can those with exceptional technical skills be compensated at a higher rate? And as it relates to the primary care fields, can those with experiential knowledge that allows for an accurate diagnosis in a shorter time with less additional diagnostic tests be compensated at a higher rate? 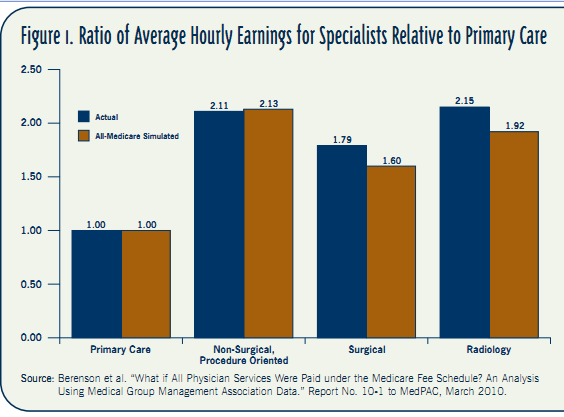 You conclude that primary care physicians are currently undercompensated for the care they provide. I completely agree. Your hypothesis is that the reason for their undercompensation is because of the overcompensation of procedural physicians. Somehow you believe this is the will of the RUC. The data does not support this hypothesis. 1. The RUC has recommended increases in the value of E/M services each time primary care organizations and/or CMS have requested a review. 2. Since the start of RBRVS a mid-level office visit has increased in compensation from $31 (1992) to $66 (2010). Many procedures have seen significant decreases in their cost during that time. Another needed update is “Relative Value Unit (RVU) Explained: CPT E&M Code 99223.” Authored by The Happy Hospitalist and published over three years ago, this contains Carville-like incomplete information that adds confusion to the discussion. Either the author does not understand the process or there is intent to inflame. I believe the physician author can be excused for a lack of complete knowledge. I have a difficult time giving a Ph.D. with a resume’ such as yours a free pass. How about we go ahead and dive into “RVU Explained” and complete the explanation in a constructive fashion. Perhaps this will be educational to you and others. In rewriting that piece I would make a number of suggestions. The whole system of comparison is confusing—that we can agree on. When many people compare the financial value of physician services they focus on just the work RVU. This assumes the practice expense and malpractice RVUs are properly accounted for which is, of course, subject to debate. I believe the references to geographic variations also detract from the point of the discussion. So we are going to look at just work RVU and we are not going to throw geographic mud into the water, yet. We will also look away from the continuing decline in the Medicare Conversion Factor (CF). The CF is multiplied by the RVU’s to determine the actual dollars paid for the service provided. The 2011 CF is $33.9764; 2010 was $36.0791; 2009 was $36.0666; 2008 was $38.0870. From 2008 to 2011 that is a 10.8% decrease that has nothing to do with the RUC and nothing to do with specialist compensation. Dr. HH is apparently is unaware of the 90 day Global period and presented procedure values as if they are for just that with no other care included. What the 90 day Global means is that all care related to the patient for that procedure is included in the value. It is a “package price” that was enacted in part to simplify issues with billing for services. The 90 day Global includes the pre-operative office visit, all pre and post procedure care, the procedure, and all follow up for a period of 90 days after the procedure. The number of these visits, the complexity of the visits, the time associated with performing the procedures are estimated by surveys by providers of what would be considered a “average” patient having a certain problem. Generally, more than 50 surveys are completed and the 50th and 25th percentiles are calculated. The validity of the surveys is discussed at the RUC. When you subtract the total of these wRVUs you are left with a wRVU of 14.38 for performing the procedure. Our goal on this road to clarity is to speak in dollars and cents, not wRVUs. So if we take 14.38 wRVUs and multiply it by the 2011 conversion factor of 33.9764 we find that the surgeon is paid $488.58 for actually doing a total knee replacement. The surveys performed by providers that are reviewed by the RUC also account for details regarding the time associated with performing a service. Dr. HH refers to 99214 as a “20-30 minute visit.” Actually, according to the RUC database, that visit, on average, is 40 minutes, which includes 5 minutes of pre-service time, 25 minutes of intra-service time and 10 minutes of post-service time. The wRVU for a 99214 is 1.50 and that translates to $50.96. If we calculate that out to an hourly rate you get a rate of $76.45 per hour of physician work. The numbers Dr. HH listed included funding for practice expense and malpractice expense. As stated earlier, I am leaving those factors out of this analysis. That totals to 229 minutes or 3.82 hours. $488.58 divided by 3.82 hours equals $128.01 per hour of physician work. For the combination of cognitive and technical skill to eliminate pain and improve the function of the patient with arthritis. However, that overstates the hourly rate as it does not include the time associated with the other visits. Let’s dive deeper into the weeds and add back in the RUC times for all the additional visits that are part of the 90 day global. That would be another 4 hours of physician time in this example. The 90 day Global total wRVU for a total knee replacement is 23.25; multiply that times the CF equals $789.95. Divide that by 7.82 hours of care and the orthopaedic surgeon’s hourly rate is $101.02 per hour. Just like I consider my primary care colleagues undercompensated for the care they provide, I also consider my orthopaedic colleagues undercompensated for the care they provide. And in spite of the assertion by Dr. HH that the total knee is “worth 16 times more,” the hourly rate differential between the 99214 ($76.45/hr) and the 27447 ($101.05/hr) is $24.57/hour. So the time associated with a total knee is priced at 1.32 times the price of an office visit, not 16 times. Next on Dr. HH’s hit list is the laproscopic cholecystectomy, cpt number 47562. Going through the same analysis as total knee, the rate for performing the surgery is $107.49/hr and the total care of the patient for the episode is $97.45/hr. That is not “eight times more,” it is 1.27 times more. I consider my general surgical colleagues undercompensated for the care they provide. Colonoscopy rate is $100.29/hr. 1.32 times, not “2.6 times” more. I consider my gastroenterology colleagues undercompensated for the care they provide. Removal of a kidney stone is $94.39/hr. 1.23 times, not “16 times” more. I consider my renal colleagues undercompensated for the care they provide. Complex brain aneurysm is $117.39/hr. 1.54 times, not “50 times” more. I consider my neurosurgical colleagues undercompensated for the care they provide. Retina surgery is $103.16/hr. 1.35 times, not “13 times” more. I consider my ophthalmologist colleagues undercompensated for the care they provide. These values for services are disturbingly low across the board. This is the key information that needs to find a massive audience. We cannot afford to get bogged down in a diversion by a Wall Street Journal writer. This cannot degenerate into a battle between physician specialties. One could conclude from the hourly data presented that the RUC has done a very good job on completing its assigned mission: define the use of physician resources to complete a task. The data as accurately presented above should get you and others to stand up and thank the physician volunteers who attend the RUC meetings. There is another group of physician volunteers who attend the CPT meetings that deserve thanks for what also has been a very thankless job. These are not people blogging in an attempt to get a speaking engagement. These are caring professionals who see the RUC as a good collaborative option to help balance the payment system. It is easy to point to something as a problem. Let’s work together to find a better way without being distracted by efforts to eliminate the method that has done as well as it could within the guidelines allowed. But I also have a job, a family, and a mortgage. I really do not have the time to pour into this at the level that is probably needed. So I have to hope that since we have the same first name, I can work with you and we can be allies with the same goal: the health of the people who live in the United States of America. Pingback: Stifling Primary Care: Why Does CMS Continue To Support the RUC? | Replace the RUC! Pingback: Primary Care Ready To Rumble Over the RUC | Replace the RUC!